Editor’s Note: The author is currently working on a two-part book series, entitled “The Ancient Roots of Sūrya Namaskāra and Vinyāsa-based Yoga”, where he would expand the themes covered in the current article series and is looking for funding of his book project. Towards this end, he has started a major INDIEGOGO grassroots campaign. For more information, please visit this link. The current controversy over the ancient roots of Sūrya Namaskāra and Vinyāsa-based Yoga has called into question the very integrity of modern Yoga. In recent years, the antiquity of this Yoga has been routinely denied by Western scholars, who claim that it was fabricated from Western forms of exercise in the early 20th century. This article series will demonstrate the evolution of Sūrya Namaskāra as a daily rite of Tantric Yoga practice from the 10th through the 19th centuries, based on my nine years of research into dozens of overlooked, un-published Tantric works, some of which are extant in my ‘Namaskāra Timeline’ video (below). This series will also contain multiple appendices with a considerable number of previously un-documented passages from the vast Tantric corpus, which has come down to us. The debate over the origins of the Āsana-based, modern trans-global Yoga movement has reached a climax in the wake of the second ‘International Yoga Day’ event, held in 2016 on the summer solstice. Sponsored by the United Nations and the Indian Government, both the 2015 and 2016 celebrations saw the largest numbers of Yoga practitioners ever gathered together to practice on a single day (June 21st). For the inaugural International Yoga Day (IYD) in 2015, more than 190 countries sponsored Yoga events of their own, with Prime Minister Modi and other sponsors lauding this posture-based form Yoga as ‘the invaluable gift of India’s ancient tradition.’ In both events, more than 35,000 people, led by Narendra Modi, India’s Prime Minister, gathered in New Delhi to practice a variety of postures included within the dynamic postural sequence known as Sūrya Namaskara. This particular style of posture-based yoga is known as ‘Vinyāsa,’ or ‘Vinyāsa Flow’ and entails the sequencing (vinyāsa) of innumerable postures (Āsanas) often choreographed to a breath regulation practice (prāṇāyāma). Regularly practiced in some form by some 30+ million people in the world today, this style of Yoga can be traced to Tirumalai Krishnamacharya of the Mysore school of Yoga, who defined it as the core practice of ‘Hatha Yoga’, which he claimed to have revived from ancient texts known as ‘Yoga Shastras.’ Now, some eight decades later, India, backed by the United Nations, has strongly re-emphasized the antiquity of this practice, declaring that the Vinyāsa-based system celebrated by millions at both IYD events represents the ‘ancient’. “…Most Yoga students and teachers are not aware that the famous Surya Namaskar, and the variations out of the South Indian Schools of Hatha, never existed before the 20th century…Surya Namaskar is a very modern innovation or invention in a long history of evolving Yoga practices.” -John Mumford. “Surya Kriya (i.e. Namaskāra), is of great antiquity… it is a breathing sequence which accompanies the physical postures. It develops mental clarity and focus, and removes weakness in the body” -Swami Sadhguru, spokesperson for the U.N.’s ‘Hatha Yoga’ Program. Sūrya Namaskāra and Vinyāsa Yoga: India’s Ancient Heritage or a Modern Invention? Despite denials by Western Scholars of Surya Namaskāra’s antiquity, India doesn’t seem to be listening. In preparation for the 2016 IYD event, Indian and UN officials again lauded the Vinyāsa- based style of Yoga as the ‘ancient heritage of Indian Yoga,’ while putting a particularly strong emphasis this year on the foundational place of Sūrya Namaskāra in Yoga. Indian Prime Minister Modi and other officials proudly announced a commemorative ‘Surya Namaskara Stamp Series,’ featuring what is known today as the twelve-part ‘classical’ form of the practice. Meanwhile, as recorded in thousands of photos taken for both IYD events, practitioners around the globe engaged in the poses shown in the stamp series, including hasta utthanāsana (‘pose with hands upraised’), adho-mukha-śvānasana (‘downward facing dog’), and bhujangāsana (‘cobra pose’). Other Namaskāra-based postures found in the Vinyāsa system of the Mysore school were practiced, including a variety of lunges and standing, transitional poses such as vīra-bhadrāsana. Hence, we have two completely contradictory claims as to the history and heritage of ‘Hatha Yoga’. One side, represented by the United Nations, the Government of India, and the majority of Yoga practitioners in the world today identify the phrase ‘Hatha Yoga’ with a Vinyāsa-based postural practice believed to be ancient and indigenous to India. The other side, represented by factions of Western scholarship, asserts that Vinyāsa-based Yoga, including Sūrya Namskāra, was fabricated by Krishnamacharya in the early 20th century, and has nothing to do with the ‘classical’ tradition of Haṭha Yoga, represented by the Hathapradīpikā, and that this fabrication was influenced by the nationalistic fervor extant in 1930s India. If true, this would suggest that the majority of India has duped itself into believing that the Vinyāsa-based Yoga practices engaged by millions on IYD has ancient roots. On the other hand, perhaps a ‘Sleeping Giant’ has awoken to reclaim its own ancient Yoga heritage, one which has simply not yet been identified in source texts. Only one of these contradicting claims can be correct. To determine whether or not Sūrya Namaskāra may have come down to us from overlooked sources, such as Krishnamacharya’s Tantras, we must first identify the defining features of the ‘Classical Surya Namaskāra’ sequence, as it is known today. The sequence of poses shown in the 2016 stamp series commemorating International Yoga Day (below, left) is exactly the same as that which is taught by the Bihar school (below, right). A nearly identical version was taught by Krishnamacharya to Srivatsa Ramaswami, who in turn still teaches it today.5 The twelve sequential poses comprising the series are said to represent the months of the solar year. 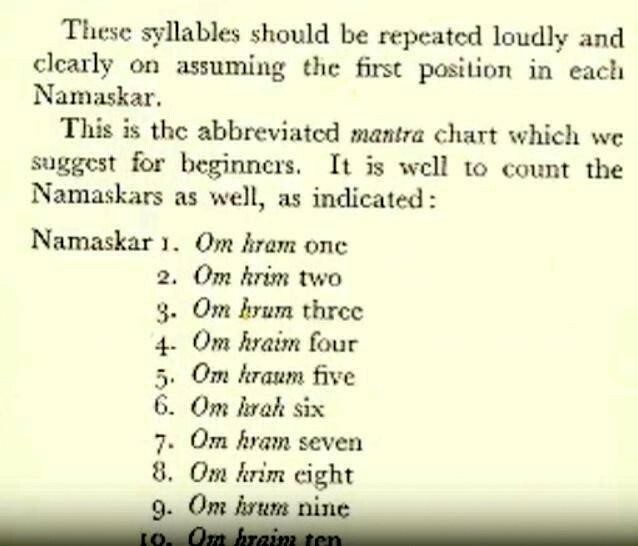 A sequence (vinyāsa) of specific seed mantras are applied in both schools6 to the poses – namely ‘HRĀM, HRĪM HRŪM, HRAIM, HRAUM, and HRAH.’ These are known as the ‘solar’ (saura) mantras, said to be particular to the worship of the sun (sūrya). Each pose in the series is led by its corresponding mantra, in numerical order (see chart above). The six mantras are each engaged twice, once for the descending phase of 6 postures, and again for the 6 poses comprising the ascending phase back to the original standing position (as depicted above). In addition, each pose and its corresponding seed mantra is correlated by Krishnamacharya and the Bihar school alike to twelve names for the sun. Mujumdar’s passage on the role of ‘dands’ in ‘Surya Namaskara’ is referenced by scholars such as Sjoman, Alter and Singleton, as evidence that Hindu nationalism and international physical culture shaped modern yoga, and that Surya Namaskāra was therefore invented in modernity. 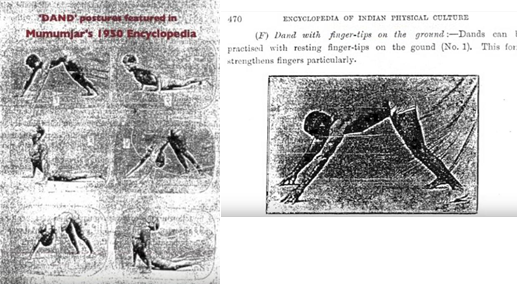 Sjoman (54) attributes Mujumdar’s danda exercises to a text on Indian gymnastics and wrestling written in 1896 (the Vyāma Dīpikā), claiming that this work was the “primary foundation for Krishnamacariar’s vinyāsa-s.”13 ‘Dands’, he opines, are merely ‘variations of push-ups,’ later ‘broken down’ into individual āsanas such as tāḍāsana, pādahastāsana, caturanga-dandāsana, and bhujangāsana. 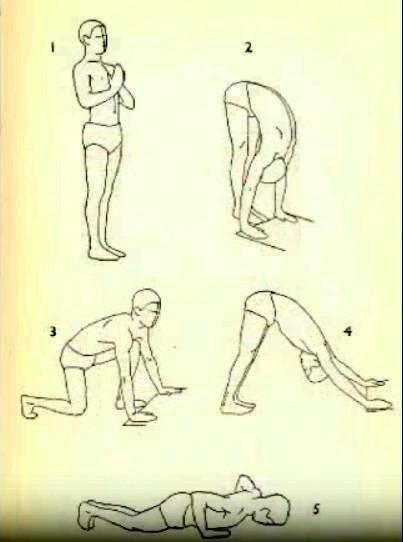 Twenty-two years earlier, Balasahib Pratinidhi Pant, a Maharashtra Raja of the district of Aundh, published his ‘Ten-Point Way to Health (1928),’ a short treatise featuring ten of the ‘classic’ twelve poses of Sūrya Namaskāra later taught by Krishnamacharya and the Bihar School. They and Pant alike presented the ‘classic’ sequence as led by the solar seed mantras (HRĀM, HRĪM, HRŪM, HRAIM, HRAUM, and HRAH), doubled for the second set of six poses, as described above. Pratinidhi Pant’s postures are reminiscent of those later exhibited in Mujumdar’s Encyclopedia in1950 and of those celebrated in the commemorative Stamp Series issued by the Indian Government on the second International Day of Yoga, 2016. The Raja of Aundh tailors the language in his presentation of Sūrya Namaskāra to make it palatable to Western (and overwhelmingly Christian) audiences of the time. Therefore, it is not surprising that Pant omitted textual sources for the practice from his treatise. As I will demonstrate in Part II of this series, there is overwhelming evidence to the contrary, extant in the overlooked corpus of Tantric literature long since available to scholars,21 spanning a period of over 1,000 years of Yoga history (see ‘Namaskāra Timeline’ video). This evidence demonstrates the antiquity and evolution of Sūrya Namaskāra as a daily Yoga practice (especially in the region of Maharashtra), as claimed by Pant, Mujumdar, Krishnamacharya (and his students), and the Bihar school. Unfortunately, Singleton and others seem to have overlooked the crucial evidence of ancient Yogic roots extant within a postural practice led by the solar seed mantras, a practice that by the late 14th century or so had become ubiquitous in the pan-Tantric Yogic rite known as the Namaskāra Vidhi – and especially in Maharashtra. The Search for Classic Sūrya Namaskāra in Ancient Source Texts: What are we looking for? 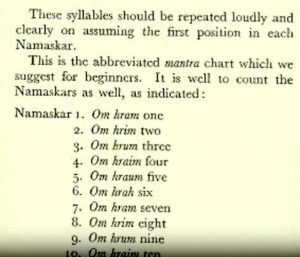 Is there any sign in ancient texts of the ‘classic’ mantra-led Namaskāra sequence, as commonly taught by Pratinidhi, Krishnamacharya, the Bihar school, and portrayed by Mujumdar in his 1950 Encyclopedia? 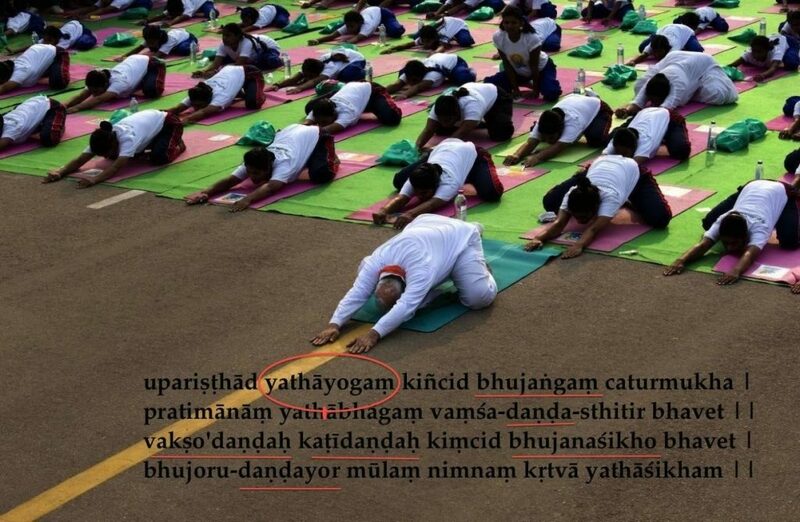 If so, is it considered a Yoga practice, as claimed by Krishnamacharya and the Bihar School? Are its postures ever referred to as dandas in ancient sources, namely or a series of ‘bending’ poses made by the body, as suggested by Ramaswami’s epithet of ‘Danda Samarpanam,’ and as claimed by Mujumdar and others? Does it contain a core, pivotal pose wherein ‘eight body parts’ come to touch the earth (Ashtānga Namaskāra)? Is this sequence led by a series of seed mantras, particularly the six ‘solar’ seed mantras, as commonly taught today? The epithet of danda (bending pose) referring to the individual postures of the sequence, and/or ‘Dandavat’, an umbrella term for the sequence of Danda postures as a whole? Six ‘Seed’ Mantras which respectively lead the twelve poses, particularly the following mantras associated with the sun – HRĀM, HRĪM HRŪM, HRAIM, HRAUM, followed by HRAH. In fact, a Namaskāra practice featuring these core tenets is prescribed in innumerable source texts representing some 10 lineages found in three major branches of the medieval Tantric tradition, as depicted in my ‘Namaskāra Timeline,’ featured in this article. These lineages include the Śaiva-based ‘Path of Mantras’ (Mantramārga), the Goddess-based Kaula Tantras, and those of the Pāñcarātra, the Vaishnava-based movement of Tantrism to which Krishnamacharya’s lineage belongs. Among the earliest works to detail a postural Namaskāra practice are a group of Tantras belonging to the Śaiva Mantramārga, which served as the scriptural authority for a sect known as the Vīraśaivas (‘Warriors of Śiva’), who flourished (and still flourish today) in parts of Maharashtra, Karnataka, and Kerala, is the Vīraśaiva Tantra,22 comprising a corpus which dates to perhaps 1000 A.D., include the Amśuvati, Ajita, Dīpta, Kārana, Kāmika, Makuta, Vāthula and Candrajñāna Tantras. Here Nīlakantha gives us clear evidence that the postures of the Namaskāra sequence, long before they were given names familiar to us today, such as ‘plank pose (caturanga dandāsana)’ or ‘downward facing dog pose (adho-mukha-śvānāsana)’, they were generically referred to as ‘dandas,’ or a contiguous series of bending poses. Appendix A contains a sample list of Sanskrit (Tantric) passages referring to the Yogic rite of Sūrya Namaskāra by its core pose, the Ashtānga Namaskāra (or Ashtānga Pranāma), or as Mujumdar puts it in his Encyclopedia of Indian Culture (1950), ‘Sāshtānga Namaskāra,’- the ‘[Sequence] containing the ‘Eight Body-Part prostration Pose that are brought into contact with the earth. This evidence counters the claim made by Singleton that Sūrya Namaskāra as a dynamic physical practice comprised of postures called ‘dands’ (dandas) and led by a peak pose which engages ‘Eight Body Parts’ (sāshtānga-) was fabricated in the early 20th century by Pant and Krishnamacharya. 2 Yoga Body, p. 180. 4 from ‘Textual Evidence for a Namaskara as an Āsana,’ featured in the Luminescent’ (online blog), posted days after the IYD event, June 2016; my emphasis in bol d font. 6 It would be incorrect to say that the Namaskāra sequence taught to Ramaswami represents the ‘Mysore School,’ since Pattabhis Jois, an earlier student of Krishnamacharya’s who, to my knowledge, did not teach the classical version of the practice conveyed to Ramaswami later in Krishnamacharya’s life. 8 Especially since Krishnamacharya and his students (particularly Iyengar) are responsible for naming many of the Āsanas practiced today. 9 The Complete Book of Vinyasa Yoga, pgs. 213-217. ‘household worship (‘pūjā-grhād… pranamet dandavad’). 15 Yoga Body, pgs. 205-206. In so doing, he also dismisses Ashtanga Vinyasa, the system of Yoga taught by Krishnamacharya’s student Pattabhis Jois, as “a powerful synthesis of āsanas and dands” inspired by national physical culture programs. paramānanda tantre- ‘pūjā-grhād bahirdevīm pranamet dandavad-bhuvi | mandale namanam naiva sāshtāngam dandavat caret || jānubhyām ca padābhyām ca mūrdhnā hastayugena ca | caturanga- pranāmo’yam mandale vihitah śive’ || iti || -Paraśūrāmakalpasūtra, lines 7713-7716. 18 Mantramārga is an umbrella epithet given in the Śaiva Tantras (and by Śaiva exegetes) to their tradition of Tantric Śaivism as a whole, regardless of lineage. In the Tantric ‘Path of Mantras,’ (Mantramārga) everything in the Universe, moving and non-moving, is generated by and forever infused with the Goddess Speech (Vāk), so that in the Mantramārga the term Yogin (Practitioner of Yoga) is synonymous with Mantrin (‘One Who Engages with Mantras’) -jñātenānena jñātam syād & vān-mayam sa-carācaram | mantrino mantra-mārga-sthā & yogino yoga māśritāh || -YuJaĀr 1.74. 19 The rite of Anga-nyāsa (‘placement of the limbs’ on the earth) is not to be confused with the rite of installing by hand the core retinue of a given deity’s seed mantras onto one’s body, often known as Śarira-nyāsa (‘placement on the body’). These are two of the three consecutive ‘Nyāsa’ or Mantra placement rites ubiquitously prescribed within the sixteen preliminary daily Yoga practices (upacāra, adhivāsa) prescribed in all of the Tantras (and gradually eliminated in the so-called post-Tantric ‘Hathayoga’ texts, along with all vinyāsa or mantra-led based postural Yoga; – see Haṭhapradīpikā 1.61, to be discussed in Part II). For daily Sun Salutation or worship, the Yogin engages the solar seed mantras, personifying the Śakti (‘Power’) of one’s Core Deity, for all three of the following Mantra placement rites, otherwise called Vinyāsas, or ‘sequences.’ The first is Kara-nyāsa (‘Hand Placement’), wherein the core six seed mantras are placed one at a time onto the fingers and palm of the right hand with the left). This is followed by Śarīra Nyāsa (‘Body Placement’), wherein the same set of six mantras are installed in due sequence (vinyāsa) onto pre-designated parts of the body, or the six chakras, respectively, in later Tantric texts. The final vinyāsa of Mantras in the daily preliminary Yoga rites of the Tantras is called Anga-nyāsa (‘placement of the limbs’ on the earth). Here, the now mantra-infused limbs of the body are engaged through a series of body-bending Danda poses comprising the Namaskāra sequence, with each pose respectively led by HRĀM, HRĪM, HRŪM, HRAIM, HRAUM, HRAH. (shad-anga-nyāsa-mātram) is a sequence comprised of (six) Danda or Bending Postures (danda-nyāsa)—‘nyāsasyāpi krtsnasya karanā-śaktau danda-nyāsa -mātram shad-anga-nyāsa -mātram vā kuryāt’ |-Kriyāsāra, lines 8893-8894. 20 Yoga Body: The Origins of Modern Posture Practice, pages 124, 180-181, 205-206. 21 The majority of texts referenced in this Article series were downloaded from the collection of Tantric ‘E- texts’ available at www.muktabodha.org. Others derived from my own transcriptions of manuscripts from the Nepalese ASHA library collection, and from manuscripts personally recovered in Kashmir in 2012. 22 The texts listed in this paragraph do not call themselves ‘Vīraśaiva’ Tantras. As Professor Sanderson has pointed out in his article ‘The Śaiva Literature’ (2014: 84), the scriptures referenced by Vīraśaiva authors are redacted versions of older Tantras (Āgamas) belonging to the Śaiva Siddhānta lineage. I am referring to them as Vīraśaiva Tantras only because they are among those which provide the core ritual material for the Vīraśaiva sect, as demonstrated in Nīlakantha’s Kriyāsāra. 23 An index of sample passages may be found at the end of this article. 24 The Kriyāsāra is repeatedly cited by Rhagavabhatta in his commentary on the Śāradā Tilaka Tantra, completed in 1493 A.D. Later citations of Nīlakantha’s work include Vedajñāna’s Dīkshādarśa (16th century), the Śrītattvacintāmani, completed in A.D. 1577; the Tārābhaktisudhārnava of Narasimha Thakkura, completed in A.D. 1668, and the Śāktapramoda of Rāja Devanandan Singh of Bihar, completed in 1889. 26 ‘Yadvā āvahanādi-samskārāshtakam samuditam eva smrtvā pratyekam-arghyamātram datvā brahmanām-arghyavasāne kramena surabhi-padma-triśūla-makara-sragākhya-mudrāh pradarśyāngānām namaskāra-mudrām pradarśayet|’–Kriyāsāra, lines 10741-10745. 27 That is to say, varying levels of detail are provided from text to text. Tantric scriptures (āgamas, tantras), with the exception of the Vīraśaiva scriptures, tend to present only a terse outline on the prescribed rites of daily Yoga practice. On the other hand, it is the nature of exegetical works, such as the Kriyāsāra, to expound on these rites in greater detail. 28 The term danda literally means a ‘staff’ or a ‘stick,’ and is used here to refer to the any combination of straight lines (rekhāni) made by the jointed body in forming a given posture in the sequence. For example, the eight-body part pose (ashtānga namaskāra, #6 in the above image, contains 8 ‘dandas’ or straight lines made with different sections of the body. 29 samāgatya drutam vipram pranamya bhuvi dandavat | svāmin mātula-putro’yam raksitah prthivīpatih || -Kriyāsāra, lines 4815-4816. 30 kutra vā gata ityevam vicāro’bhūn-mahān-mama | bhavat-krpāvaśād-drasta ityuktvāyam mahīpatih |parisvajya dadau tasmai patān bhūsanamujvalam ||-Kriyāsāra, lines 4818-4819. The Anga-Pradakshina (‘Body Flow’) Sequence of spontaneous Body Mudrās, often described as a ‘Dance’ Vinyāsa or Vidhi (dusk sandhyā); this would become the source of the modern ‘Chandra Namaskāra’ variations.